A warrior US president, along with hawkish generals in charge of administration geopolitics and neocons infesting Washington risk unthinkable nuclear war on North Korea by design or accident. South Korean President Moon Jae-in wants peace, not conflict with the DPRK. There’s much he can do toward achieving it by acting responsibly. Washington is dangerous, not the DPRK, wanting peace, stability and respect for its sovereignty, not war, despite its hostile rhetoric, remarks responding to Trump’s unacceptable threats. Pyongyang failed to respond to Moon because his actions belie his rhetoric. After suspending installation of additional THAAD missile systems on South Korean territory, pending an environmental assessment, threatening China, Russia and the DPRK, he now plans to approve them, following US Joint Chiefs chairman Gen. Joseph Dunford’s visit to Seoul. America’s “military capabilities” are solely for offense, not defense – at a time the only threats to its security are invented ones as unjustifiable justification for endless wars of aggression. Following his May election, Moon expressed outrage over the THAAD missile system deployment plan his predecessor approved to please Washington. So far, he’s acting the same way – not responsibly to try preventing US-initiated hostilities on the peninsula, risking unthinkable nuclear war. Diplomacy, not confrontation, is the only way to try resolving contentious issues. In July, Beijing and Russia jointly proposed Pyongyang halt further nuclear tests together with Washington and South Korea suspending provocative military exercises the DPRK believes are preparations for war. Washington rejected the proposal. 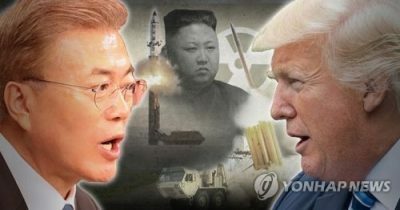 If Moon genuinely wants confrontation avoided, his responsible option is calling off so-called Ulchi-Freedom Guardian military exercises with Washington, scheduled from August 21 to 31 – along with halting the installation of additional of THAAD missile systems on South Korean territory, as well as ordering existing installations removed. The Trump administration can do little more than complain. It won’t attack its South Korean ally even though Moon’s safety could be jeopardized. He’ll need support from his government and military to pull this off successfully. He’ll likely have strong public approval. Avoiding possible nuclear war on the peninsula should be his top priority. Risks and other considerations are secondary. Is he bold enough to do the right thing? Humanity holds its breath to find out. “No one should be allowed to decide on a military action on the Korean Peninsula without South Korean agreement” – a hopeful sign he needs to follow with responsible actions to avoid what no regional nation wants.